No keyboard or mouse needed! Teach your robot what to do by using motions and gestures. Skilligent Robot Learning and Behavior Control System is a software product which enables robots to learn procedures and skills directly from human users. The product is a set of software components specifically designed for straightforward integration into control loops of PC-controlled robots. The software needs to be integrated with sensors, motors, actuators and robotâ€™s control system via a set of open APIs. On one side, the software controls every motion of the robot. On the other side, the software uses a video camera, a microphone and other sensors to receive guidance from a human user. The software analyzes humanâ€™s gestures, looks at the objects presented by the user, listens to the sounds and tries to guess what robot is supposed to do. 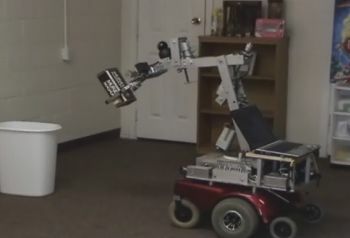 Through trial and error, the robot understands what needs to be done and associates learned behaviors with stimuli used by the human. Over a few training sessions, the robot refines its understanding of the domain, the procedures and skills required to serve the user. Skilligent is currently seeking partnerships for further sales and distribution of their software packages. Interested parties can contact them through their website. Skilligent LLC is headquartered in Dallas, Texas and operates an off-shore research and development center.